Last year, I was slightly obsessed with these sequin UGG boots in black but I couldn't find them anywhere. While picking up some gifts today, I saw these at Nordie on display in array of colors. Now that these are available I am having second thought because I am asking myself how many times will I actually wear these UGG boots. I got a pair of grey and wore them perhaps 2 or 3 times only. I love sequin converse because a little sparkle really goes a long way in dressing up a gal's outfit. 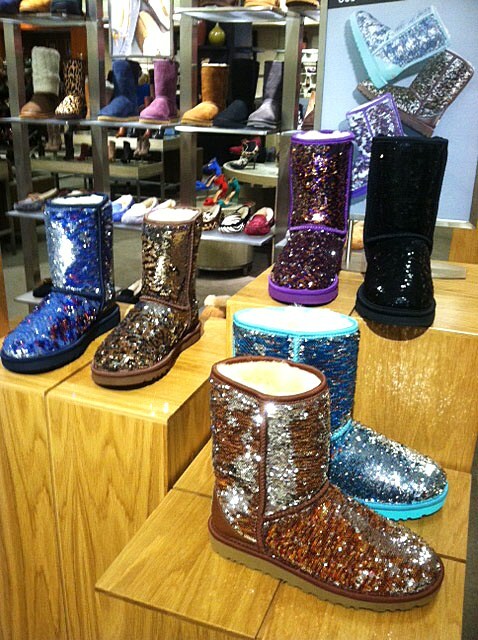 Sequin UGG boots on the other hand may be too much of a good thing. What do you think? I'm not a big fan of Uggs, but I must say I prefer them in sequins than plain. Sparkles always make everything better! I think they're cute, and very useful in Chicago! they're ok. the black and dark blue is nice.